When you step foot into Eric Fisher Academy, you step into a passion driven educational venue. 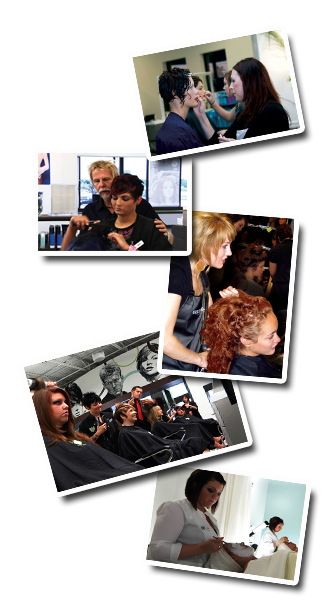 Our goal is to prepare students for greatness in hair and skin care. We’ve built a state of the art school styled with our students success in mind. EFA was founded by an industry innovator. We left the “old” rules at the door and designed our own package deal so students can ease through the state board exam plus have the knowledge, skills and confidence needed to be a success in the beauty industry. We’ve created an educational hub. Every day we strive to stay on the forefront by constantly educating our instructors and teaching the latest techniques in hair and skin care. We bring in renowned guest artists such as Sally Rogerson, Oscar Bond, Michael Baker, and Shawna Parvin. EFA is a Dermalogica Partner School, a MAC Cosmetics affiliated school, a MUD Make-Up Partner School and we teach our students in depth business training with the Prosper U Business Training Program created by Eric Fisher. We supply top of the line products like Aquage, L'Oreal Color, Dermalogica and MUD Make-up. Dedicated to excellence, we have set our standards high so you will succeed. EFA is all about Y-O-U! Interested in starting a new career? Call 316-440-5555 x 303 to schedule a campus visit. Begin experiencing the Eric Fisher Academy difference today. Our Admissions Team can’t wait to meet you! Eric Fisher Academy’s Student Salon and Spa offers a wide range of services including Chemical Resurfacing Skin Treatments and L’Oreal Powerdose Conditioning Hair Treatments. Schedule a relaxing spa treatment or update your current look today and help our students prepare for greatness!